Investigating plants that may be toxic to dogs is a daunting task, especially if you're researching asters. Not only are there 180 species in the Aster genus, but other flowers have "aster" in their common names. If you're planning a garden -- or panicking after your pet devoured a few aster petals in the park -- rest assured that almost every flower known as "aster" is considered non-toxic to dogs. In addition, the one exception to this rule grows in very few places in the U.S. The woody aster (Xylorhiza orcuttii) is poisonous for dogs. The wild plant is rare, but worth keeping your eyes open for if you walk your dog in desert or scrubland areas in western regions of the U.S. Look for low-growing, shrubby clusters of flat-headed, daisy-like flowers with white petals and yellow centers. All parts of woody aster are potentially toxic to your dog, including stems, leaves, flowers and roots. If your dog ingests any part of the plant, seek treatment. This plant has mainly been observed in U.S. Department of Agriculture plant hardiness zones 10 to 12, but has also been observed in isolated places as low as USDA zone 5. Plants within the Aster genus are not listed in toxic plant directories as poisonous for dogs. The genus includes 180 species, both wild and commonly cultivated. Most have "aster" in their common names as well as in their botanical name. Confusingly, however, some aster species have two botanical names, such as the blue wood aster (Aster cordifolius or Symphyotrichum cordifolium), which grows in USDA zones 4 to 8. The China aster (Callistephus chinensis) does not pose a danger to dogs who ingest it. This flowering plant is also known as annual aster. 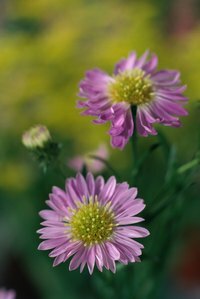 You'll most likely encounter China aster in cultivated gardens rather than in the wild. If you're planting them in your own garden, you'll have your choice of dwarf cultivars or those that grow up to 3 feet tall. These annuals come in a variety of colors and shapes, from the classic single-headed daisy form to double-headed, somewhat fuzzy silhouettes. Golden asters are not toxic to dogs. These flowers are cousins to aster species, with both belonging to the Asteraceae family. The plants known as golden asters fall into either the Chrysopsis or the Heterotheca genus. This large group of plants can be annual or perennial, wild or cultivated, and they straddle a broad range of climates. The prairie golden aster (Heterotheca camporum), for example, is cultivated in USDA zones 4 to 8, and is also found in the wild. As a group, plants known as golden asters usually have yellow petals and yellow disks, as well as the classic daisy shape. Also know as the Easter daisy, the giant aster (Townsendia sericea or Townsendia exscapa) is a dog-friendly plant. The "giant" in its name refers not to its height, but to the size of the flower head. A low-growing plant with a stemless look, it sports 2-inch-wide blooms in light pink to white, with bright yellow centers. Chances are it will thrive in your sunny wildflower garden, because it tolerates USDA zones 3 to 12.